by the river evokes the textures of a small Australian town in 1962 through lean episodic poems that drift along gently until moments of intensity break their banks. Through a leisurely accumulation of detail – houses on stilts, fruit bats, a blotchy carpet of mango pulp, wisteria, cricket, bags of lollies – the town comes into focus, along with the lives of its people, especially protagonist Harry Hodby and his family. 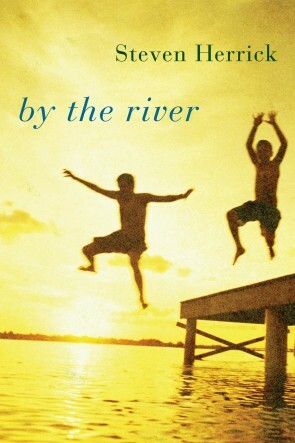 by the river is one of Steven Herrick’s many award-winning verse novels for young adults and the recipient of several prizes, including a 2005 New South Wales Premier’s Literary Award (Ethel Turner Prize for Books for Young Adults). As a verse novel, it combines narrative bones with poetry’s compression, as well as its sonic and lyrical qualities. Image by image, glimpse by glimpse, by the river collects its narrative fragments and vivid impressionistic slivers as ‘the big river’ that ‘rolls past our town’ collects and influences the stories of the people it circles and observes. If, as psychologist and philosopher William James sees it, human thinking proceeds like a stream of consciousness, by the river exemplifies its dynamic flux – its mobile and shifting nature, its snags, shifts, and flow, and the ways the currents and undercurrents of memory, hope, and thinking entwine and wind. Harry’s voice and perspective tie these strands of narrative and imagery together. Harry’s ‘I’ is laconic and self-effacing. He is an unlikely hero, wounded, unambitious, and boyish, stationed in the liminal space where childhood pleasures and adult possibilities converge, trapped within the confines of a town he is outgrowing. The verse novel traces its roots back to epic poems such as Virgil’s Aeneid and Homer’s The Odyssey, each of which centres on a heroic protagonist. Unlike Aeneas and Odysseus, Harry’s name does not give the work its title, and, in his adolescent uncertainty, he has little in common with the elevated heroes of the traditional epic. Aeneas, for instance, is repeatedly referred to by Virgil as ‘pius’, which connotes a worthy, dutiful, strong hero, reverent towards the gods, full of drive and vision. Instead, Harry – fourteen, awkward, fed up with the compression of small-town life but lacking ambition and direction – fits into a lineage of coming-of-age texts centring on Anglo-Celtic heterosexual Australian masculinities, such as George Johnston’s novel My Brother Jack (1964) and films including Gallipoli (directed by Peter Weir, 1981) and The Year My Voice Broke (directed by John Duigan, 1987). Harry’s portrait finds energy in its expression of his ordinariness, recalling the brilliantly evoked, flawed characters of Dorothy Porter’s The Monkey’s Mask (2000), a best-selling verse novel which inspired Herrick’s own. The Monkey’s Mask and Porter’s other verse novels experiment with jump-cutting, editing, and sharp, lean lines to achieve a cinematic aesthetic, as well as freshness and vitality. As Porter said: ‘I’m just longing for poetry with verve and nerve … I’m longing for poetry that just smacks me across the head.’ Porter once commented that ‘far too much Australian poetry is a dramatic cure for insomnia’. Writing ‘good’ for Porter, at one stage of her career, involved ‘strictures I placed on myself … i.e. nothing that would offend the children’s lit gatekeepers’. Herrick, too, whose first published poem (written at the age of eighteen) was called ‘Love is like a gobstopper’, depicts the identifiable, the awkward, and the ordinary, rather than some kind of (perhaps illusory) idea of aloof and inoffensive poetry. The results in Herrick’s work are fresh, accessible, and engaging, closer in tone and mood to the wit, play, and hijinks of Roald Dahl and Andy Griffiths than the ‘emotion recollected in tranquility’ associated with William Wordsworth. with a hook in the throat? The mysterious circumstances of Linda’s death form one of several questions Harry faces. In ‘It wasn’t God’ he tells himself it wasn’t God who ‘watched the bubbles rising / and fists knocking / against a jammed window’. It wasn’t God who ‘dragged Mum / quietly away’, cataloguing the unfathomable cruelties he has observed before eddying towards the poem’s last stark question: ‘Was it?’ This ending exemplifies the poems’ tendency to swerve and kick at their endings. Another question concerns how people leave the town, which relates to the larger issue of what kind of future he might be able to hope for. In his plain-spoken words and his directness, as in Jill’s, there is vitality and emotional honesty. In his smaller moments, too, it is the simple that delights Harry. Harry hopes one day to be another kind of ‘escape artist’, but for now tends to escape from the story, focusing instead on others’ lives. The first mention of ‘my brother Keith and me’ in an early poem ‘The scrapheap’ prefigures a refrain of ‘Keith and me’, and the brothers’ development is yoked together through their sharing of key experiences. The story of the boys’ lives is revealed gradually, even obliquely. Harry remembers key shaping incidents through the poems. His narrative, a kind of retrospective internal monologue, drifts along quietly until the sharp flinch of lines that reveal in honed fragments the painful events of his life, especially the death of his mother when he was seven and Keith six. The poems work the way memory does, or rivers do, meandering, slowing down, speeding up, occasionally flooding. The line movement follows this pattern, proceeding phrase by phrase, line by line, until lines overflow, spilling into the next in enjambment that expresses emotional experience not easily contained. that drew blood in a blur. two weeks before she died. and the colour of Linda’s cross. The mundane image of classroom chalk is framed by references to the two formative tragic events of Harry’s childhood: his mother’s death and that of Linda, who drowns at thirteen when the river floods. In primary school, Linda’s friendship offers Harry the possibility of consolation and creativity. When he is mocked for the dull exterior of his family home, brushed brown with sump oil rather than painted, Linda comes to school the next day ‘with my favourite orange cake – / two slices’. She also brings a story she has written about a house painted dull brown, and the storm that washes away its modest exterior ‘to reveal a house / coated in gold, / glistening / like a palace’. not for a long time. Harry only knows traumatic departures, though – his mother’s, Linda’s, and that of Miss Spencer, the school’s eighteen-year-old secretary, with whom Harry is infatuated, and whose pregnancy forces her to leave town. When twenty-two-year-old neighbour Wayne Barlow brings home a stream of young women, Keith and Harry hide and look through the window, learning ‘the weight of a breast, / the curve of a hip, / the weird rhythms and sounds / naked bodies make’. This creepy voyeurism collapses when Wayne brings home Eve Spencer. Suddenly, a woman might be more than a weighed breast and moving hip. Seeing one of Wayne’s conquests as a subject, rather than an object to be ogled, Harry glimpses the unfair treatment of women in the patriarchal culture he has previously never questioned. Harry cries, his moment of emotional flooding apt in the damaged and abject landscape, but the image of the lawn mower twists the scene away from pathos. While Harry’s father’s devotion is seen by his sons as exemplary, Harry’s own embodies a kind of stasis. The early poems in by the river function like expository chapters in a novel, establishing voice, characters, and key narrative scaffolding. After the development of the story through episodic poetic slices as sensual as Hodby watermelon, the narrative arcs back, like the river, to wrap things up. As Harry recognises the ‘part inside; / the good part’ of himself that has been formed by his father’s example, he begins to take steps that will lead to his departure, observing, once more, the ritual of dividing the watermelon in three, savouring at last, the textures and vitality of this shared moment ‘one deliberate bite at a time’. James Vicars and Yve Louis, ‘Poetry as Bull-Leaping’, New England Review no. 4, Spring 1996, 10. FELICITY PLUNKETT is a poet and critic. She has a PhD from the University of Sydney. Her first collection of poetry Vanishing Point (2009) won the 2008 Arts Queensland Thomas Shapcott Prize and was shortlisted for several other awards. Her chapbook Seastrands was published in Vagabond Press’s Rare Objects series in 2011, and she is the editor of Thirty Australian Poets (UQP, 2011). She is Poetry Editor with University of Queensland Press and a widely published reviewer.